FACTS OF INTEREST: The 16 species of chipmunk are distributed across North America and northern Asia in woodland areas. Chipmunks dig a complicated system of underground burrows that extend down several feet into the soil and contain storerooms, a nest and many connecting tunnels. 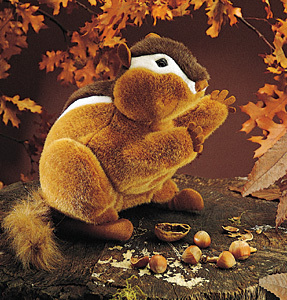 Chipmunks can carry seven chestnuts in one trip, three in each cheek pouch and one in their mouth. A chipmunk's winter cache of nuts, seeds and grains is very large, since they don't really hibernate but must eat all winter.